Traditional craft: Visitors learn how do paper is produced during a Dance of Paper workshop. For Nhung, who works for a German NGO in Ha Noi, her connection with the traditional handmade paper in northern villages was fate. The endeavour, a company selling modern products made out of do paper and hosting workshops on the handicraft, began four years ago. Nhung helped a Vietnamese-German friend learn more about Vietnamese calligraphy, which is often beautifully featured on the paper. The duo accumulated a lot of knowledge about the papermaking process and its long history. After a time, Nhung’s friend became disinterested and the project was put on hold. But in 2013, Nhung decided to return to it because she didn’t want to waste the effort they had already put in. To devote more time for her “spiritual child”, as she calls it, Nhung started working part-time at the NGO. On her journey toward preserving do paper, Nhung teamed up with two young people, Duong Hoang Linh and Nguyen Hong Nhung, who became the project’s art designer and technical adviser, respectively. 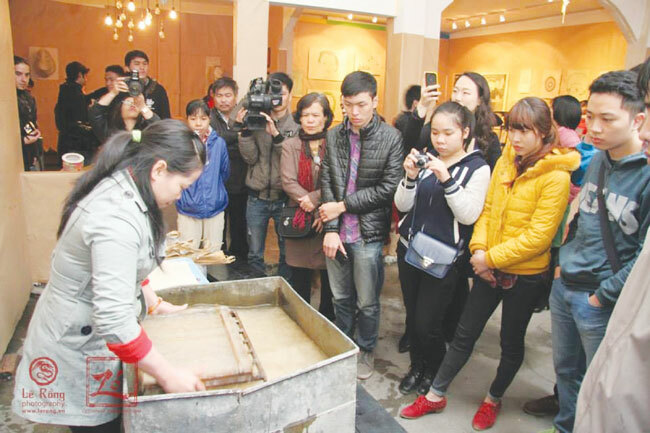 With her business mindset coming from a Foreign Trade University bachelor’s degree and a master’s degree on Business Management in France, Nhung, CEO of the project, said she thinks the key to preserving the paper-making is to increase the amount of products made with the paper. “Like any other farmers, the do tree growers just care about economic benefits. Once the paper is being used widely, the demand for raw materials will increase, and growers definitely will invest more in this kind of plant,” Nhung said. Using modern designs for do paper products can increase consumption of the material, Nhung said. So she and her teammates aimed to create products with both traditional and contemporary features. In January 2014, the group officially launched their product line, including notebooks, matchboxes, photo albums, postcards and calendars. 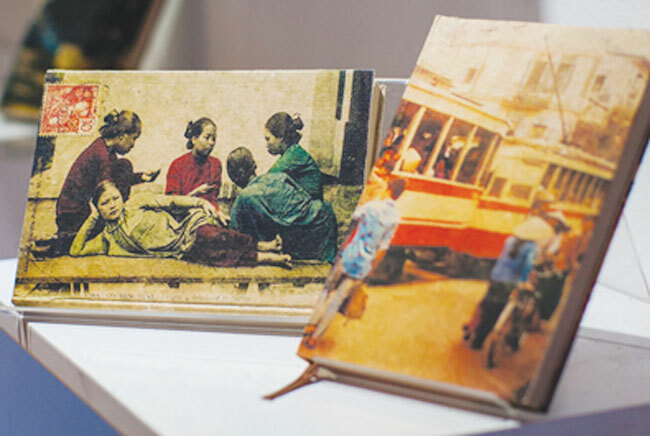 They use typical Vietnamese images, such as street vendors or a tangled mass of power lines, to adorn their unique products, which are available in many souvenir shops in Ha Noi, HCM City and Hoi An. “Before the market would accept our products, we all had to spend our own savings for this ‘spiritual child,’ ” Nhung said. She also held workshops that gather young people and expats living in Ha Noi to learn about Do papermaking and its history. In March last year, Nhung also started Vu Dieu Cua Giay (Dances of Paper), an art event where young artists can showcase their works created from do paper. Sponsored partly by the Danish Embassy in Viet Nam’s Cultural Development and Exchange Fund (CDEF), the event not only encouraged artists to use the traditional paper more, but also helped do paper makers understand the importance of their job. Nhung said she intends to turn her two-storey rental house into an art space displaying artworks and products using do paper. She has kept in close contact with artisans in Dong Cao Village in Bac Ninh, currently the only village in Viet Nam producing the paper. Nhung said she hoped to connect different papermaking villages so they could exchange their experiences and preserve the traditional craft. The project recently won a Social Enterprise Support Programme award for 2014, and earned a US$10,000 grant. The award seeks out and gives support to social enterprises during critical development periods to enhance their effectiveness and social impacts. With the grant, Nhung and her team will invest in new products and research.